I came across this 30 Day Music Challenge over on Bailey's blog I Know All The Words. That, coupled with The Grammys the other day, has encouraged me to incorporate more music on the Muse. Seriously, I love music. I sing all the time (not just in the shower), and I've been told I have a pretty good voice. So why not open the door and let you guys in to my music world. I'll try to stay with this 30 day challenge as best I can with links to the songs instead of embedded videos...maybe. Since I blog every other day, I'll do two challenges at a time. Feel free to take this up as well. ♥ Day One ~ Your Favorite Song: Breathe Me by Sia ~ This is such a difficult one to start with because I've had a ton of favorite songs over the years from One in a Million to Joyful Girl. I picked this song because I can sing it and because it makes me want to do things. I don't know what things; it just inspires me and reminds me of that line from The Perks of Being a Wallflower: "and in that moment, I swear we were infinite." | Prabal Gurung for Target yellow sweater | Nastygal spotted blouse | F21 boyfriend jeans | Parisa G by Guess wedges | Morris Moskowitz vintage clutch | Nail polish: Sally Hansen slick slate | InPink & Forever 21 jewelry | ♥ Day Two ~ Your Least Favorite Song: Trapped in the Closet by R. Kelly ~ This song has no redeeming qualities and has a godforsaken 33 chapters. What kind of foolish song about some idiot in a closet deserves that many chapters. If you like this song (or R. Kelly for that matter), then we can't be friends anymore...j/k...maybe. Speaking of music, I'm off to a Pink concert tonight! lmao, you made me laugh with the R.Kelly's trapped in the closet, I also don't really like it for those many chapters, like really? LOL on the least fave song. Great look! I especially like your shoes. Have fun at the Pink concert, I totally love her! I love the sweater and the wedges. Prabal Gurung for Target is perfection. :D The wedges look gorgeous on you, and the nail colour is fab. 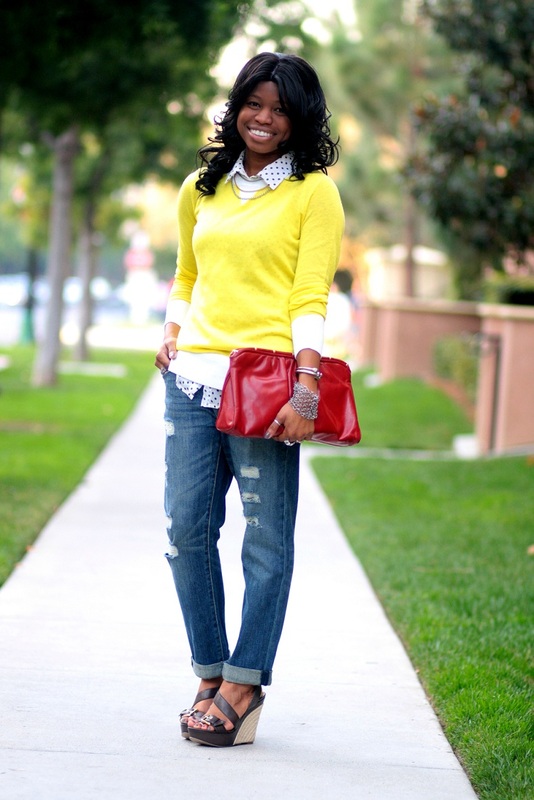 I'm obsessed with polka dots, so obviously, I'm smitten with this look :) That blouse is just perfect, and i love the way you paired it with the bright yellow sweater: perfection! That polish looks great with your skintone! 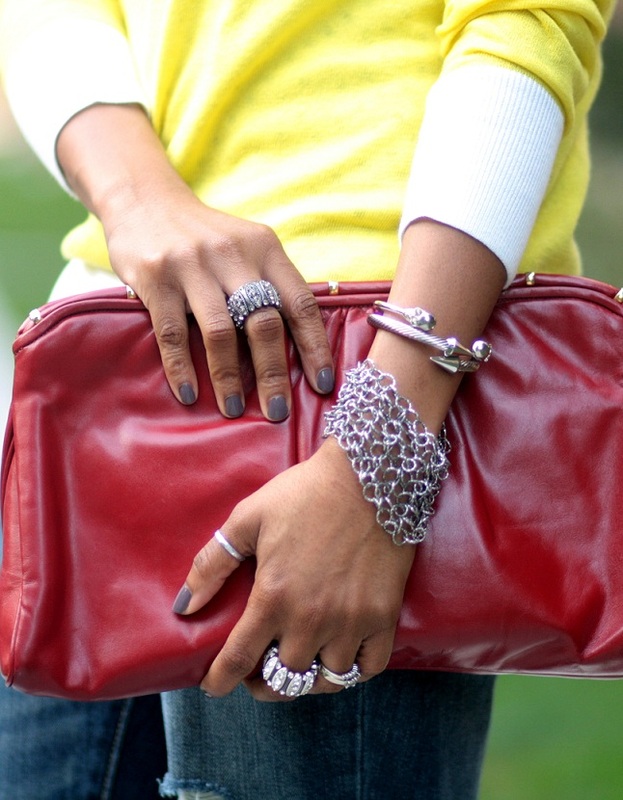 I love the look of a casual outfit, with a thick bracelet! And love the fit of the boyfriend jeans - I really have to get myself a pair this season! The yellow is so bright and pretty on you! Super cute look dear! i so love your denim dear!!! My type of denim. 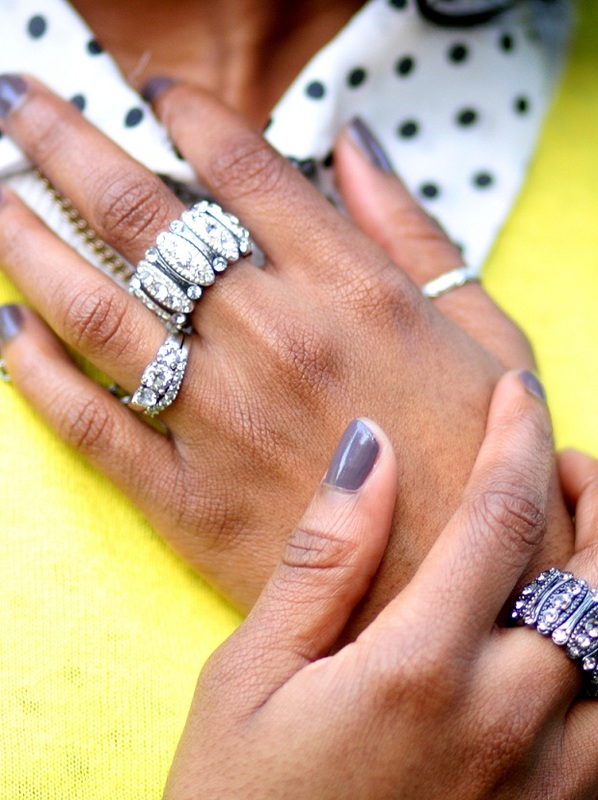 Especially loving all the jewelry! Aww I love that Sia song, haven't heard of the other one but I guess theres no point in searching it if it's your least fav lol! Such a cute look- bf jeans are on my shopping list. so loving your look, oh jeez you matched them so well sweets. How cute you look! I love that nail polish you're wearing too, I have a color like that on my list of "need to buy". Sia is one of my favorites but I'm horrible at song titles so I'm not sure I've heard that one. Will have to look it up! Thanks for the mention! I love that Sia song too, and your entire outfit. It is seriously cute! 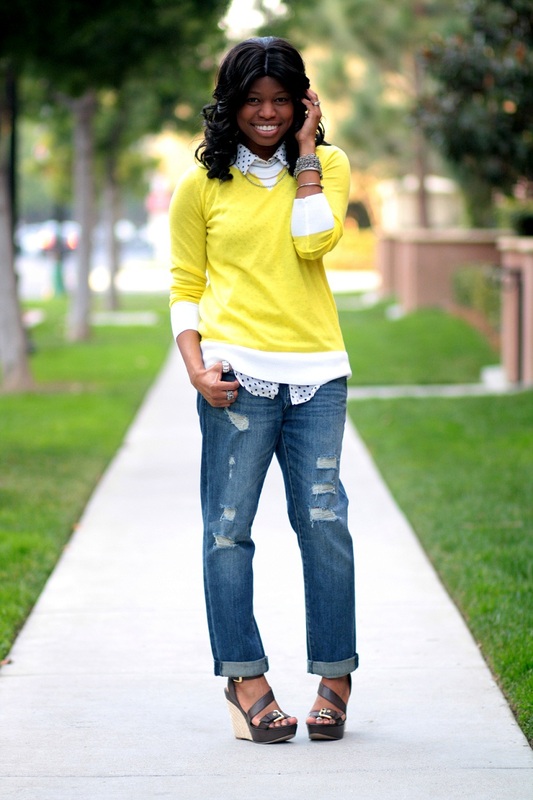 I love this look, the layering and pop of yellow are perfect! I found you on monday mingle, pop over for a visit if you can? Cheryl, what a delightful challenge!!! I love your choices. Also, loving that yellow sweater. Girl you look great in yellow! You should wear it more often. Go Prabal Gurung!!! super cute! the jeans are killing it!! Yellow is definitely you color, i love those wedges!!! That Prabal Gurung sweater is a great thing to layer a printed tee! Loved its color! The photography is excellent! i love that nail polish!! and the peek a boo dots are cute! Haha you don't like Trapped in the Closet? But why not? Kidding! Hi Cheryl, you should enter a singing contest...you never know until you try! Loving the vibrance of lovely yellow in your outfit, the wedges are awesome. Great use of beautiful accessories. Cute outfit, loving the wedges and shirt especially - enjoy the gig tonight! I wish I could be wearing sandals right now...so jealous!!!! Cute look! Love that sweater's color. This is a cool thing to do with music... Love the color of your sweater! Un look muy bonito y muy colorido. gorgeous look!! loving your accessories!! :) I have a giveaway on my blog and I would love to invite you to join! one big kiss!! Love your outfit! Your shoes are adorable, and they actually look comfy! Oh R. Kelly. His music is SO strange. What happened to that man?! I love Sia. I fell in love with her in college, and her music holds so many memories for me. I love your outfit - I am so in love with boyfriend jeans ever since I got my first pair. They are so wonderfully comfortable! Love all your primaries in one look! Breath Me always makes me tear up a little. I always associate it with the end of "six feet under"
How was Pink? I've always loved her! And those jeans are adorable! By the way you look great on yellow, so pretty! love this on you!!! too cute. Love the yellow. Your photos are sensational. How was Pink? I adore her.